Peitzmeier Maschinenbau machine builders based in Germany specialise in the construction of grinding machines. Their latest invention, the Omni-Grind Twin 3100 AC, enables automated grinding and polishing of workpieces in the metalworking industry. The machine builder relies on HepcoMotion’s GV3 guidance to prevent damage to the steel during processing; the linear guide system enables precise alignment of the grinding tool in the range of hundredths of a millimetre. Peitzmeier had to adapt their grinding machine to meet these requirements. The heavy grinding tool, usually mounted on a double-stranded U-rail, had to be replaced in favour of a lighter tool that could be aligned more precisely on just a single guide rail. The guidance system previously used by Peitzmeier in this machine was unsuitable and so Peitzmeier had to find an alternative supplier. 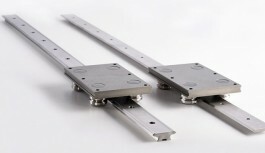 Peitzmeier found what they were looking for with HepcoMotion – a company that has specialised in the development of linear guide systems and automation components since 1969. Peitzmeier opted for Hepco’s core GV3 linear guidance system. “The system consists of precision ground guide rails and a carriage with V bearings,” explains Thorsten Pfau, Field Sales Manager at HepcoMotion Germany. 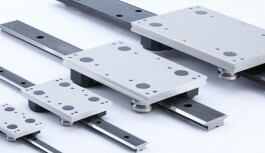 “The bearings have a V-groove which fits on to the V shape of the running surfaces on the guide rail. These bearings allow low-friction movement at speeds of up to 8 metres per second.” Also the guide rails offer sufficient rigidity to withstand the contact pressure of the grinding tool: “We were looking for this exact combination of precision and resistance to deformation,” says Peitzmeier. Three sinks are moved onto a processing table via a conveyor belt and then clamped in position with pneumatic cylinders. The sinks are then moved to the grinding belt, which moves in a trapezoidal circulation system. The grinding tool (which moves horizontally on the guide system, between the feet of the machine) presses an abrasive belt on to the surface of the workpiece using a roller, so that it achieves the desired grinding effect. The ability to precisely adjust the grinding tool ensures that the machine never grinds for too long in a single position. Behind the grinding tool, a polishing tool is mounted to a second guide rail. The stainless-steel wash-basins can then be polished to a high gloss. A further consideration in this application is the need for the guide to withstand contamination arising from the grinding process. This is where Hepco’s GV3 comes in. Hepco’s V guide system effectively addresses the problem of debris entering the sliding mechanisms thanks to its self-cleaning action, ensuring a smooth and accurate grind. Having invented the V guide system nearly 50 years ago, Hepco is well renowned for its V guide technology and the many benefits it offers.